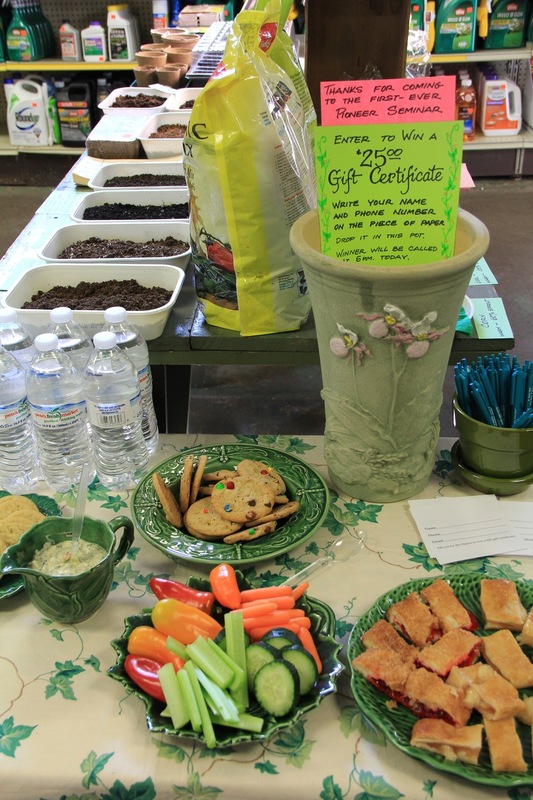 On Saturday, February 27th, we held Pioneer Garden's first ever seminar in the store--Seed Starting! We had a great turnout, and many people interested in growing from seed for the first time. You'll find Bill's tips in a separate blog post--here, we wanted to share pictures from this special day. 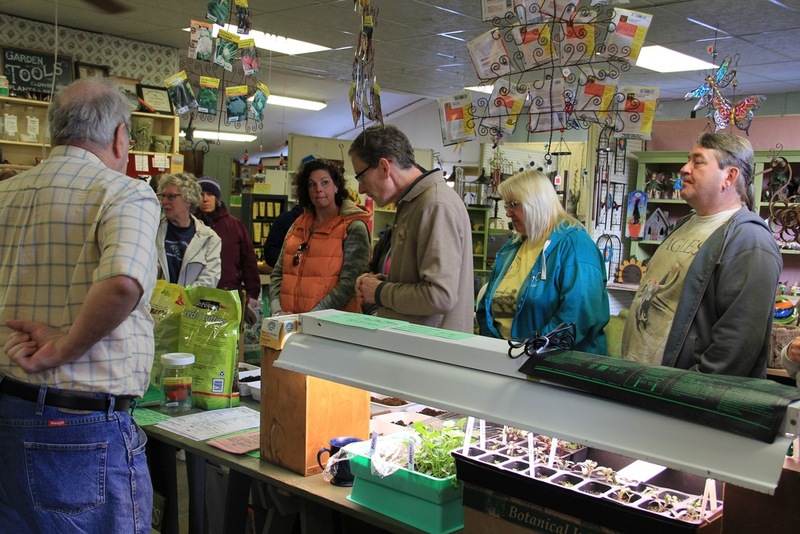 It was exciting to have so many people gathered in our store to learn how to start their own seeds. Meet Jeff. He's our beekeeper and a "honey" of a guy. This year, we're carrying his beeswax candles here at Pioneer. For those of you who are already in on the secret wonderful-ness of beeswax, we'll see you here in the store soon. For those of you who are wondering, "why beeswax?" here are just some of the reasons to burn beeswax in your home. 1. Renewable and all natural. 6. Burns brightly and brilliantly because of the higher melting point. 7. Natural honey aroma. No artificial fragrances made with chemicals. 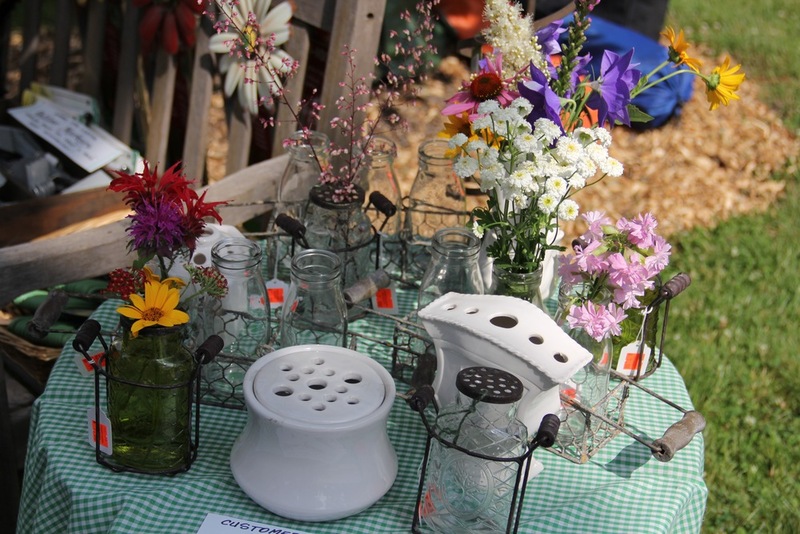 We have a large variety of candles for every need, as well as Jeff's delicious honey. Great gift ideas! Most people enjoy watching birds. Whether it's a bright red cardinal against a backdrop of snow--or the first hummingbird sighting of the year, birds bring a sense of wonder to our backyards. Pioneer is known for it's variety and freshness of bird food, and huge selection of feeders. If you're overwhelmed with your choices, narrow down the types of birds you'd like to see, and see the chart below to help make your decision. (Or come in to the store and we'll walk you through it). Pioneer is the epitome of Small Business! 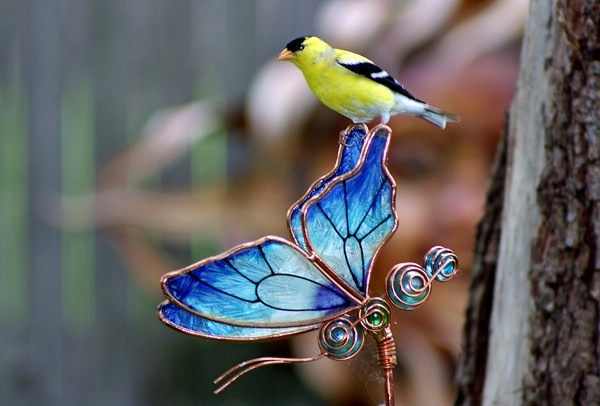 Visit us this Saturday, November 28th to check out unique gift items, tasty treats, and our bird feeder sale. This is a wonderful time of year to show your support for local businesses. When you buy local, you are supporting Villa Park, and what better gift is that? We are also holding a Kitten Adoption event with CatVando--every person that adopts gets a free cat stocking (while supplies last). Suet....pretty gross to us, but boy the birds love it! Suet is weird. People that feed with it swear by it, but others that haven't tried it often think, "Why on earth would I buy a block of fat?" According to the Cornell Lab of Ornithology, "suet is technically defined as the hard fat around the kidneys and loins in beef and mutton, but in common usage, most kinds of beef fat are also called suet and can safely be fed to birds. Suet is particularly attractive to woodpeckers, nuthatches, chickadees, jays, and starlings. Wrens, creepers, kinglets, and even cardinals and some warblers occasionally visit suet feeders. Animal fat is easily digested and metabolized by many birds; it’s a high-energy food, especially valuable in cold weather." Birds love suet, and if you want to attract some different species to your yard, this is a great time to try it. We have a huge selection of suets, suet feeders, and even specialty suet nuggets. You may be on your own diet to get ready for the holidays.....but the birds need the fat right now through the winter. Go ahead, give 'em a little treat! When we purchased the store this past spring, many people came in and asked where they could get some of the beautiful tulips they saw in their neighbor's garden...or the gorgeous daffodils they saw at the park. The thing is, you've got to plant them NOW to get the spring show. If you've planted bulbs before, you know how easy it is. If you haven't--why not? They're easy and spectacular. We have our bulbs arranged in order of bloom time. Snowdrops start as early as February (they actually come up through the snow), and alliums bloom into late spring. Whatever flowers you choose, there are a few simple steps to follow. 1. Prepare your soil. Bulbs appreciate well drained soil, so if yours is heavy with clay, add compost or other organic material to loosen it up. It also helps to fertilize now, so add phosphorous rich bone meal to encourage root development. 2. Dig your holes. The general rule is to plant bulbs 2-3 times as deep as the bulb is tall. (So if it's a 3 inch tulip bulb, it goes down 6-9 inches). Our bulb packages will give you more specific instructions on planting depth. 3. Water. Your newly planted bulbs need moisture to help roots develop and settle the soil. Water deep enough to get down to the bulb, but avoid overwatering to prevent rot. 4. Mulch. Mulch keeps moisture in and helps regulate the temperature of the soil. That's about it! Mid October to November is the ideal time to plant bulbs, so you still have time. A little work now for a beautiful show in the spring. And then your neighbors can ask about YOUR bulbs! A long time customer, Art, came in today, because he likes to use our antique scale to weigh his tomatoes every summer. Have I mentioned lately how much I love our customers? It's really a treat to get to know everyone who comes in here. Check out this giant beefsteak he brought in! (And kindly gave to me as a welcome gift for the new owner.) Seven inches across and just over two pounds, that's quite a tomato. He bought the plant here this spring, and has lovingly taken care of it through this crazy weather summer we've had this year. You'll notice it's still green, just starting to turn red on the bottom. That's our advice to all of our customers who have squirrel problems. Bring the tomatoes in just as they're starting to turn, and put them in a sunny window. The squirrels are after the juicy liquid inside, and so they'll take a bite and just leave it on the ground. So annoying after you've been taking care of them for months! You can also put a pan of water out and hope that they drink out of that, instead of chewing on your beautiful tomatoes. It's been a rough summer for tomatoes with the cold, wet spring we had, so it's nice to see that people are having success. I'll be pairing this with fresh basil from my own garden! They are the scourge of gardeners and hated at every stage of their development. Whether it's the grubs in your lawn, or the shiny green and brown beetles eating your flowers, no one likes when these visitors are around. Japanese Beetles are active in huge numbers between June 15th and August 15, eating the most between July 15th and August 15th. So they are out there NOW, keep watch! What can a gardener do at this time of year? 1. Hand Pick. Go out in the evening with a container of soapy water. Evening works best because the little jerks are kind of sluggish at that point. Tap them into the water and they'll drown. They usually tuck their legs in and fall pretty easily. (They do NOT bite or sting, so no worries on that front). And if you'd like, get your kids involved! They enjoy knocking them into the water--maybe a penny or a nickel per bug would work in your house? Try to space your spray schedule to kill as many beetles as possible, using the least amount of spray you can. Remember, insecticides kill the good insects, too. If you can manage the biggest amount within a 7-10 day schedule, you should be able to hand pick the rest. Systemics can be used, but need to be applied earlier in the year for best results. We do not recommend traps. They attract 40%-70% more beetles to the area, and not all of them will find their way to the trap! We wish you the best of luck in dealing with these little devils. 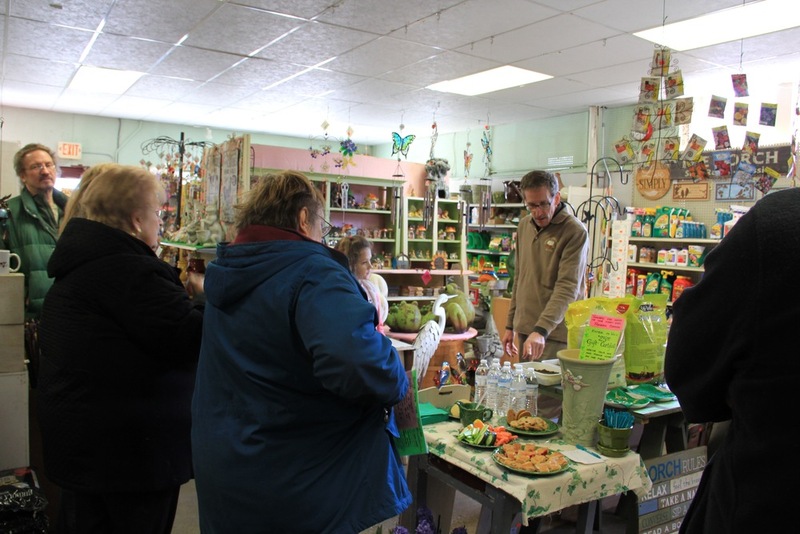 Be sure to visit the store if you have questions about ANY insects in your garden. We'll remind you in the spring when it's time to put down other products that will help reduce the Japanese Beetles in your garden. A helpful diagram from the University of Minnesota Extension office. 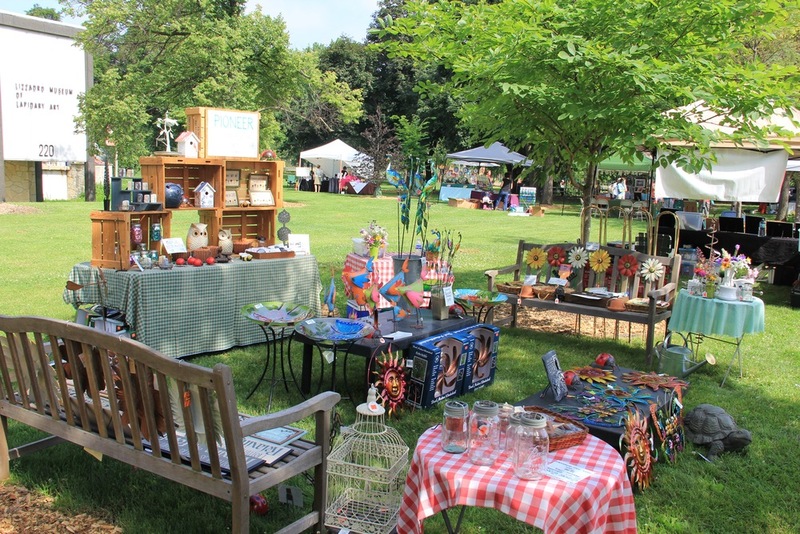 My mom and I had a wonderful time at the Elmhurst Garden Faire this year. Pioneer was welcomed with open arms. I am still constantly amazed by the loyalty of our nearby communities and by our customers who have been shopping at Pioneer for years. I wanted to share some pictures from the beautiful day--weather reports turned out wrong and it was sunny and gorgeous. Of course if you see anything you like...we have more at the store! 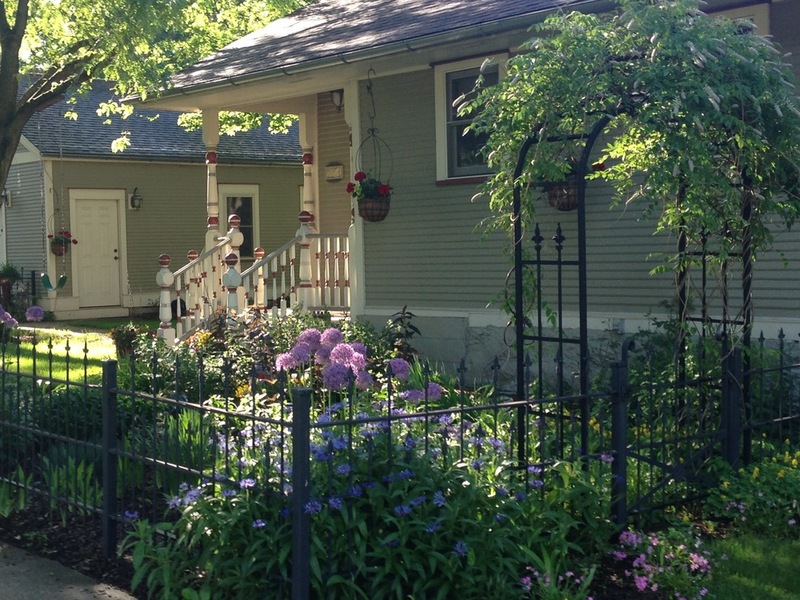 We love to see what customers create in their own yards. A beautiful vignette. A place for birds to call home. A bit of color in a shady spot. A bluebird sighting! Please feel free to share your own pictures, we'd love to see your special corner of the world. And what a great way to get new ideas! You asked for them by name, and we got 'em! GMO free and ready to add to YOUR yard this year. One of the hottest peppers on earth--grow some for yourself! Maybe this is the year to try a new tomato? Other delicious additions to your vegetable garden. Tony and I have learned so much in this last month. 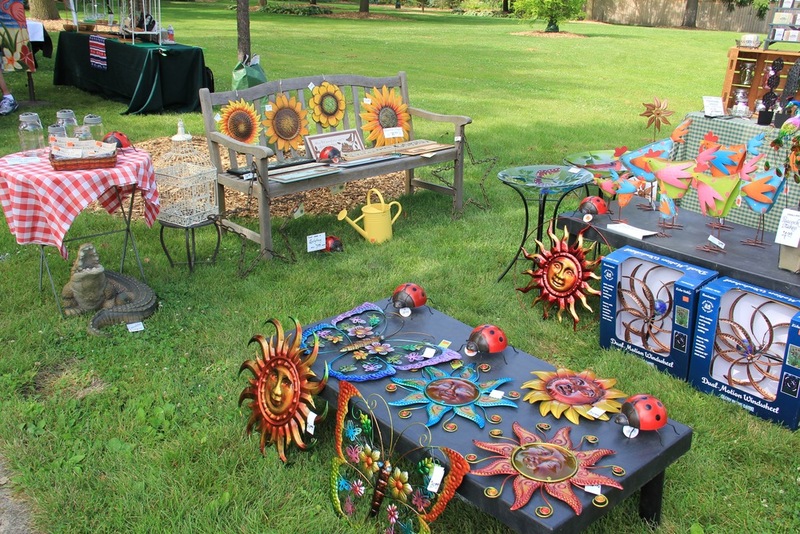 We kept hearing from vendors and others in the business that Mother's Day is a garden center's Christmas. Boy, they weren't kidding! We had so much fun meeting local gardeners and helping with their yards. I thought I'd share some pictures of all the beautiful flowers and plants that arrived for this big gardening holiday. And if you haven't started in your own yard yet, no need to worry, we have plenty more coming in all the time. White Bleeding Hearts are a beautiful addition to a shade garden. Plants keep arriving--big shipment today! Don't you just love this little guy? There is nothing quite like arriving to work early in the morning, greeted by hundreds and hundreds of gorgeous flowers. They came off the truck in the cool morning air, just waiting to be planted in your garden! We have so many perennials, annuals, herbs, succulents, and vegetables to choose from. But please keep our Zone 5 weather in mind, it's safest to plant tender annuals outside after our last frost date, which is generally May 10th. Hardiness Zone Map--we're in Zone 5 in the Chicagoland area. Our staff will help you pick the best plants for your yard, don't hesitate to ask. Our first huge shipment arrives. Tony enjoying the unloading process. Bill is always there to help you plan your garden. New staff member, Marty, is a plant expert and is excited to help you shop. Begonias are a staple in many yards. Succulents are a very low maintenance, problem solving plant. We're excited to see you over the next few weeks, and help your gardening dreams come true. Feel free to share your own review--our customer service is the most important part of Pioneer. Visit Yelp and see what others are saying about our unique store. Pansies are such a welcome sight after a long, cold winter. You can plant them even before the May 10 frost date, because they can tolerate the sometimes cold evenings, and even frost, of early spring. We've got plenty of colors to choose from. Doesn't that pot on your front porch need the welcome smiling faces of pansies? We are pleased to announce new ownership at Pioneer Garden and Feed! My husband, Tony, and I are really looking forward to sharing our dream business with you. 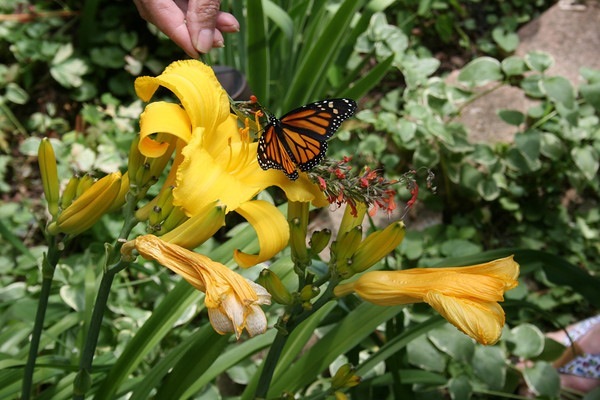 Besides living in and being active members of the Villa Park community for 17 years, we are avid gardeners and nature lovers. We preserve food, love to grow plants with our boys, enjoy birdwatching (and feeding!) and are really looking forward to serving you, our customers. Bill Karges, our staff botanist known to gardeners across the area, will remain a dedicated employee, and is there to answer any question you can think of about your lawn or garden. Please feel free to stop in and say hi. To Pioneer's long time customers...we look forward to getting to know you. And new customers...you have never been in a store quite like this. Old time charm with up-to-date knowledge on all things gardening--you'll want to stay a while. Bill Karges will help gardeners of any age! Here he gives some Pioneer history to a local Girl Scout troop. No, it's not an Alfred Hitchcock nightmare, it's springtime, and the birds are keeping busy. You may notice birds attacking your windows in these next few weeks. They have not lost their little bird brains, although it may seem that way to you. The male birds are seeing their own reflection, and attacking what they think is another bird in their territory. What can you do? We have window decals in the shape of hawks that may help scare them away. 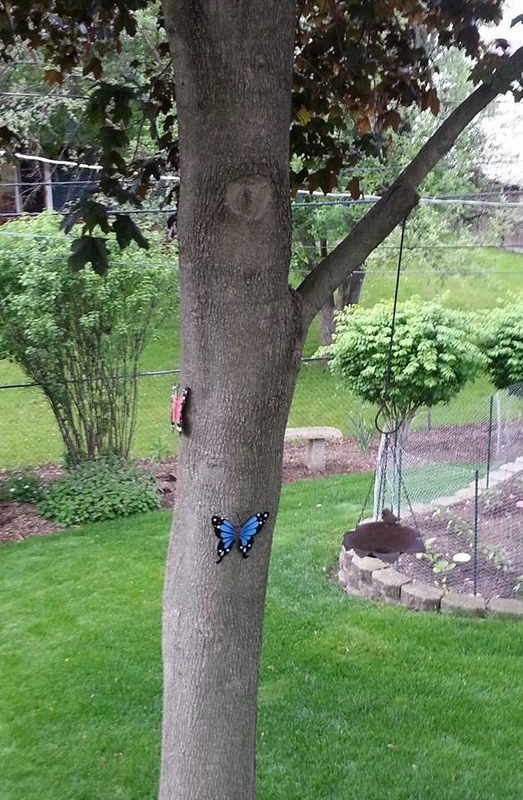 Or "scare tape", which flutters in the wind and helps block their reflection. Anything you can put on or in front of your window that will block their reflection (but they won't get their feet caught in) will usually work--bridal veil fabric, bedsheets, bamboo stakes. Luckily, the nesting season only lasts for a few weeks and the birds should be back to normal. Spring is just around the corner. If you’re wondering what to put in your vegetable garden first, here’s a list of cooler season veggies that don’t mind a little cold weather or snow. Most of them taste better before summer arrives with hot temperatures. They seem to be all the rage with foodies these days, but what exactly is an heirloom vegetable? There are several schools of thought on the precise definition, but basically an heirloom veggie is one that was grown a long time ago, and has not been modified to use in modern, large scale agriculture. Take these pictures of tomatoes. You can see the different colors and shapes, which are generally not sold in supermarkets today. Why? Most stores want perfect, round, red tomatoes to meet consumer demand. The tomatoes need to be able to ripen in a truck that will often sit for weeks or months at a time. They are grown in huge fields in monocultural (only one type) plots. Because of this, tomatoes (and other vegetables) have been hybridized and chosen for specific characteristics such as productivity, resistance to pesticides, and the ability to put up with mechanical pickers. Notice, they are not necessarily grown for taste. And this is why people grow heirlooms. The shapes and colors are strange, they might not last for weeks and weeks in your fridge, but you can not beat the taste of an heirloom veggie straight out of your garden. Purple carrots, pink tomatoes, blue pumpkins–you wouldn’t believe the huge variety that are now available that are dedicated to bringing back taste to people’s gardens. You often need to grow heirloom varieties from seed–which is part of their charm. Just think about growing a pepper that has been lovingly passed down through generations. There are many sources for heirloom vegetable seeds–and sometimes the best source is talking to gardeners you know! Pioneer has many heirloom seed varieties at the store--why don't you start your own heirloom garden? 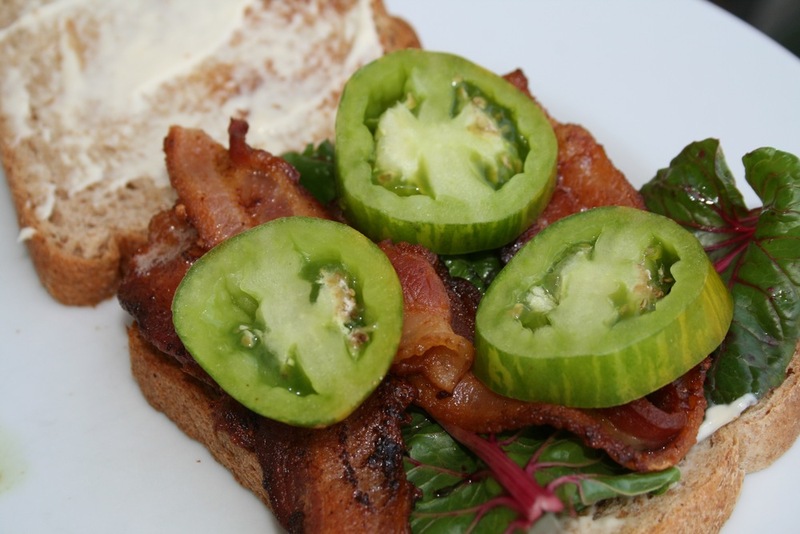 BLT with "Green Zebra" heirloom tomato and Five Color Silverbeet Swiss Chard. Everyone would love to throw some seeds on the ground and then harvest vegetables a few months later. Growing your own food is simple and rewarding, but you do need to keep a few things in mind. Here in Zone 5, our frost date generally falls around Mother's Day. For many warmer season vegetables, you do not want to plant any earlier than that. However, there are cooler season vegetables that prefer the crisp days and nights of early spring. Here's a handy guide for when to plant the most popular vegetables. Pop into Pioneer if you need help with selection, we have a huge selection of all GMO free seeds to choose for your own garden. Use starter fertilizer at planting time Add gyspum to soil to enhance "crispiness"
Delicious fresh off the vine Water vines deeply in early stages. Cut back once plants set fruit; overwatering dilutes the melon's natural sugars.